When actor Rami Malek thanked his late father while picking up his Oscar for best actor in Bohemian Rhapsody, it wasn’t just an afterthought. His father, a door-to-door insurance salesman who immigrated here from Egypt, had always emphasized to his son that he must do something “special” with his life, Rami told The New York Times. His parents were thinking of law, but—after Rami joined the debate team in high school, where his performances outshone his arguments—a teacher guided him into an acting competition with a one-man play. “It was the first time I saw my father get emotional,” Rami told Stacey Wilson Hunt in an AFTRA-SAG Foundation interview. His parents then blessed his acting career, and he went on to the theater school at the University of Indiana, Evansville. Rami and his two siblings were brought up strictly, in the Coptic Orthodox Christian faith, and the California-born Rami grew up speaking Arabic. To reinforce the family’s Egyptian roots, his father would wake his children up at night to telephone the extended Egyptian family back in Samalut. His father died in 2006, the same year Rami made his feature film debut as Pharaoh Ahkmenrah in Night at the Museum, long before his major success. 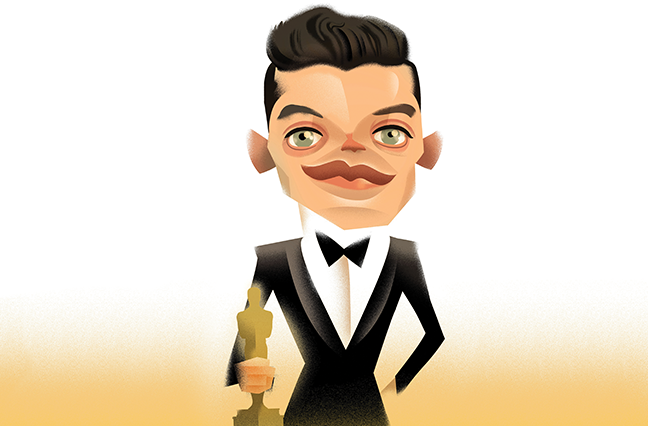 Rami’s family ties remain strong, and he has rotated through family members as his dates for the numerous award ceremonies that have followed his successes, including in television’s “Mr. Robot” and the 2018 Freddie Mercury role. He has brought all his acting awards to live in a Los Angeles house he shares with his twin, Sami, an English teacher. He is now dating his Rhapsody co-star, the British actress Lucy Boynton, and is pondering a move to London.